Made from solid oak and mango, our range of 6 seater dining tables are robust and beautiful, making a statement in your dining room. Browse our extensive collection of striking 6 seater dining tables and discover something beautiful for your home. Available in rectangular and round shapes, you’re sure to find the perfect match for your dream dining area among our range of small dining tables. Each one of our solid hardwood small dining tables is built using the very best cuts of oak and mango, carefully selected for their superior grain pattern and golden hues. Styles range from traditional rustic oak to modern, painted hardwood and some even include extending leaves, ideal for anyone that loves to host dinner parties and family occasions. Once you’ve found your perfect 6 seater dining table, complete your set with some of our beautiful solid wood dining chairs solid wood dining chairs, which can be mixed and matched as you please. Built from robust solid oak and mango, every Oak Furniture Land dining chair is designed to withstand years of wear and tear, even in the most raucous of households! Choose from dining chairs upholstered in genuine leather, soft fabric, woven grass, and painted wood, we have sets suitable for modern and vintage-style dining rooms. Or look at our complete sets of dining table and 6 chairs, where you get the table and chairs in one unbeatable price, allowing you to combine and save. When you’ve found your new small dining table and you’re thinking about hosting your first engagement, remember that along with great food and engaging conversation, mood and tone are key elements to a successful dinner party. After all, nobody wants to be blinded by bright lights or sat in the dark. Some strategically placed lamps or dimmer lights can help create a warm, cosy, ambience whilst also casting flattering lights and shadows on your guests. To make life that little bit easier for you, we provide free delivery of your 6 seater dining table to any room of your choice on all our furniture. Spend over £500 and you can split the cost of your small dining table into affordable payments up to four years. 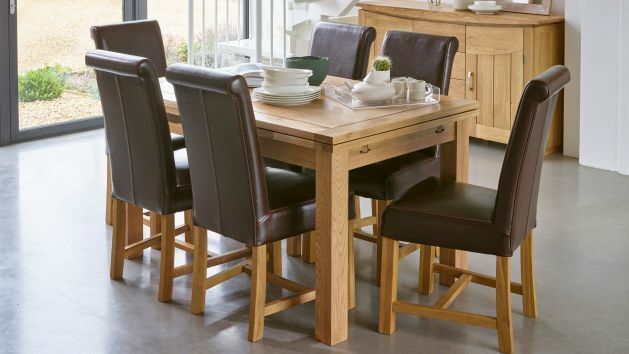 Spend over £3,500 at Oak Furniture Land and you can enjoy 0% interest-free credit for up to three years.